Do Your Efforts Measure Up to the Gold Standards of Content Marketing? On its own, a single piece of content holds little value when you are trying to make a lasting impression. Only by understanding and harnessing the strengths of multiple, varying forms of content can you reach the gold standard of content marketing (as demonstrated in the infographic below). Here is a rundown of the main strengths of different content types, and some examples of companies that are getting it just right. Regularly updated blogs provide a great forum for putting a personal face on an organization. People don’t interact with nameless, faceless brands — they interact with personalities. A blog filled with fresh, relevant content will boost engagement and help build a relationship with customers. Moreover, websites that have blogs report receiving 55 percent more visitors, according to Focus Research, and evidence shows they work in both B2B and B2C environments. Coca-Cola: Coca-Cola has used its partnership with the Olympic Games to launch the Coca-Cola London 2012 mums’ blog. In this instance, the company uses the blog to highlight the experiences of parents whose children are involved in the Olympics and to help foster a sense of community around the brand. Google: Google’s official blog provides a hub for its latest announcements, but recent posts that tied in with Mother’s Day and behind the scenes insights really injected the personality needed to bring this content to life. Many have already hailed 2012 as the year of the infographic. This visually appealing format engages web users and boosts the time spent on-page. Much of the appeal of infographics lies in their shareability and potential for quality backlinks. Forty percent of people respond better to visual information than plain text, according to Ecademy, and infographics reach out to this huge group. NewsReach: The Gold Standard of Content Marketing: Infographics must have a strong central message, backed up by a clear narrative and all the essential information. 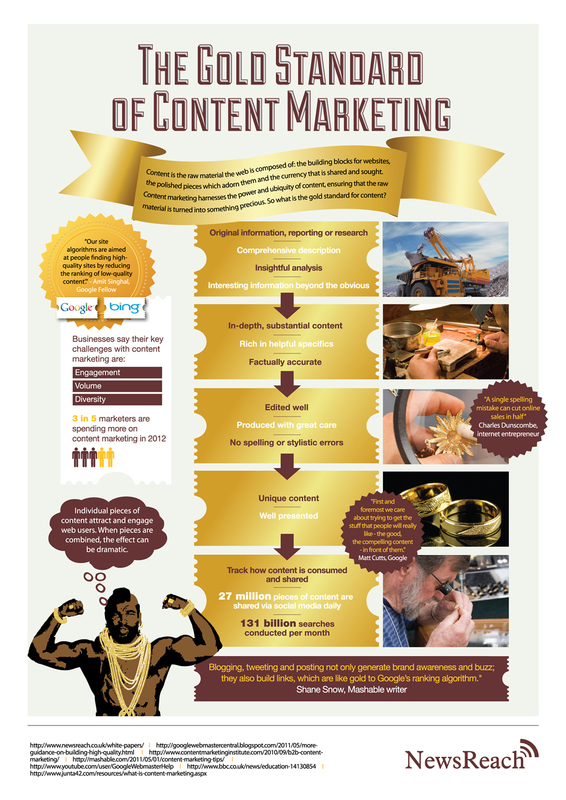 In its Gold Standard of Content Marketing infographic, NewsReach likens the creation of content to the mining of gold. Just as gold must be sourced, mined, processed, shaped, and hallmarked to become desirable pieces, so too must high-quality content. White papers act as a great brand-building tool and offer a chance to reach out into the C-suite. Decision makers want the facts in an easily digestible format. According to Eccolo Media, 65 percent of U.S. business purchasers believe white papers are either very or extremely valuable when making purchase decisions. For the company producing them, white papers are a golden opportunity to collect leads and showcase their thought leadership. And don’t forget the social media buttons. White papers are valuable content that have high shareability potential, particularly on professional networks such as LinkedIn. HubSpot: HubSpot has built up a reputation as an industry leader when it comes to white papers and eBooks. The Content Marketing Institute has built up a similarly well-stocked library of materials, securing its status as a go-to source of information in the industry. Those with a less well-known brand may want to stay clear of such a hefty form at risk of putting visitors off with a clunky downloading process. Trust needs to be built up before people are willing to share that much information. Like CMI, ensure you offer a tantalising teaser and concise description on the landing page to ensure your content doesn’t fall at the final hurdle. Where to start? Each week 100 million social actions are taken on online video — think of the buzz created by Kony 2012. Video is 50 times more likely to appear on the first page in organic rankings than plain text sites, according to The Video and Image Optimization report by Forrester, as search engines look to return more blended results and, in part, due to less competition for top rankings. It is engaging, shareable, and allows a brand to really showcase its creative side. This example from Tipp-ex really says it all. Tipp-Ex: The interactive element to this video is what helped it rack up over 8 million views on YouTube alone. The lesson here? There is always room to be creative, and if you succeed in entertaining your audience and drawing them into your brand story or experience, you’re onto a winner (warning: the video below contains some language that is NSFW). B2B brands have long known the importance of thought leadership, but the internet has taken it to a new level. Businesses should not be restrained by traditional tried and tested methods — such as white papers and reports — and should also embrace the new tools made available that can really showcase their expertise to build their brand. The top use of B2B social media is now for thought leadership. 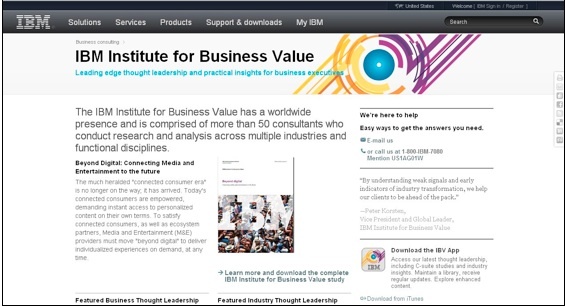 IBM’s Institute for Business Value website offers one of the best examples on the web. IBM: Full of great content in a variety of formats — reports, newsletters, even a mobile app — and designed with simplicity in mind, the Institute for Business Value allows IBM to showcase its expertise without the theatrics. It is the first port-of-call for those looking to expand their thought leadership. Whether you’re in the B2B or B2C sector, FAQs and guides help turn your website into a valuable resource hub. Impartial advice builds trust with potential customers and helps forge relationships, while pages also perform well in SERPs. With Google also indicating that it plans to place more of a focus on semantic search, FAQs could provide a valuable SEO boost when the changes sweep in. Amazon: When it comes to FAQs, simplicity is key, as Amazon demonstrates here. Ensure you perfect your navigation, and give clear, concise answers to the common questions consumers are likely to ask. 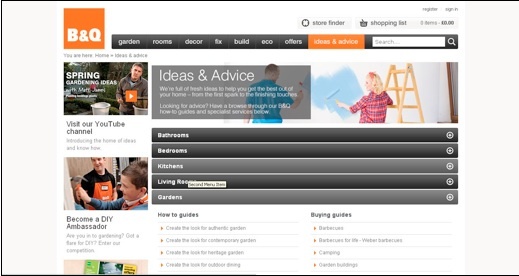 B&Q: U.K. DIY retailer B&Q has created an information hub with its Ideas and Advice section. It’s a way of saying, “We don’t just care when we’re trying to sell you something,” and offers the chance to get some great searchable terms on the site. Only by adopting a targeted and integrated approach to content in all its forms will content marketing efforts succeed. Share with us your experience with using different types of content to engage audiences and meet your marketing goals. Want more content marketing inspiration? 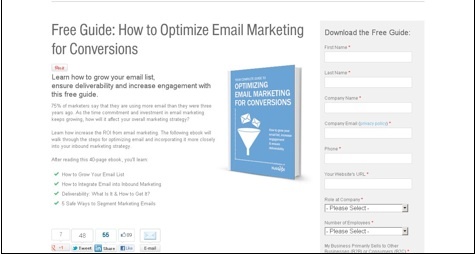 Download CMI’s ultimate eBook with 100 content marketing examples. Helen Clark has worked in the content marketing industry since graduating from the University of Lincoln in the UK with a BA in Journalism. She currently works for content marketing specialists NewsReach, searching for new ways to maximize the power of content to increase engagement and boost brand awareness. You can follow her on Twitter at @HelenMClark.